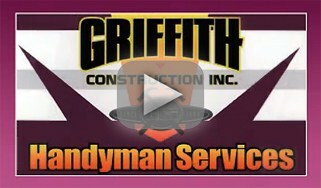 Griffith Construction, Inc. is your local and reliable handyman service company in New Jersey, specializing in any of your commercial and residential handyman repair and remodeling needs. As an owner-operated small business not needing to pay a franchise fee, Griffith Construction, Inc. prides itself on our ability to offer you, home and business owners, competitive and cost efficient rates. You may be apprehensive to try a different handyman company after a negative experience, or you may be tempted to try a handyman company that advertises incredibly low prices in coupon mailers. Before you make a move, take a look at Griffith Construction, Inc. and let us show you the Griffith difference. We are proudly and locally owned and operated since 1999, first opening up shop right here in Morris County. Over the years, Griffith Construction, Inc. (Griffith Handyman) has invested in Morris County, NJ towns and communities and established a loyal customer following. We understand that our customers live within certain budgets. This is why we work with you to develop a plan based on your needs and financial means. Boonton NJ, Boonton Township NJ, Brookside NJ, Budd Lake NJ, Butler NJ, Cedar Knolls NJ, Chatham NJ, Chester NJ, Convent Station NJ, Denville NJ, Dover NJ, East Hanover NJ, Flanders NJ, Florham Park NJ, Gillette NJ, Green Village NJ, Greystone Park NJ, Hanover NJ, Harding NJ, Hibernia NJ, Ironia NJ, Jefferson Township NJ, Kenvil NJ, Kinnelon NJ, Lake Hiawatha NJ, Lake Hopatcong NJ, Landing NJ, Ledgewood NJ, Lincoln Park NJ, Long Hill Township NJ, Long Valley NJ, Madison NJ, Mendham Borough NJ, Millington NJ, Mine Hill NJ, Montville NJ, Morris Plains NJ, Morristown NJ, Mount Arlington NJ, Mount Freedom NJ, Mount Olive NJ, Mount Tabor NJ, Mountain Lakes NJ, Netcong NJ, New Vernon NJ, Parsippany NJ, Pequannock NJ, Pompton Plains NJ, Randolph NJ, Riverdale NJ, Rockaway NJ, Roxbury NJ, Schooleys Mountain NJ, Stirling NJ, Succasunna NJ, Towaco NJ, Victory Gardens NJ, Washington Township NJ, Wharton NJ, Whippany NJ.